Located in the Midwestern part of the United States and also in the Great Plains region, Nebraska is the 16th largest state in terms of physical size but ranks 37th in terms of its population, making it one of the top 10 most sparsely populated states. Nicknamed the 'Cornhusker State', Nebraska is home to around 1.9 million people and covers an area of a little over 77,000 square miles of land. It has borders with South Dakota, Wyoming, Colorado, Iowa, Missouri, and Kansas. Nebraska also has the unique distinction of being the only triply-landlocked state in the United States, which means that if you wanted to reach an ocean or gulf from Nebraska, you'd have to travel through a minimum of three other states to get there. The state capital of Nebraska is Lincoln, while the largest city in this state is Omaha. Read on for detailed descriptions of Omaha and the other largest cities in Nebraska, including population statistics and overviews of the various features and attractions of each city. Omaha is the biggest city in the state of Nebraska. This city is located in Douglas County, of which it is the county seat, in the eastern part of the state. It was founded on the Missouri River and is very close to the state border separating Nebraska from Iowa. Omaha covers an area of over 141 square miles and is home to around 466,000 people, with over 975,000 in the full metro area. This makes Omaha one of the top 60 most populous metro area in the United States. Omaha has been nicknamed 'Gateway to the West' due to its location as a key crossing point over the Missouri River and has enjoyed a lot of growth and development over the years. It's one of the most-visited cities in Nebraska, with sporting events like the College World Series and interesting attractions like Henry Doorly Zoo drawing in big crowds on an annual basis. Lincoln is the second largest city in the state of Nebraska. This city is located in the eastern part of the state in Lancaster County, of which it is the county seat. Lincoln covers an area of around 94 square miles and is home to over 284,000 people, putting it in the top 74 most populous cities in the United States. A key economic and cultural hub for the state of Nebraska, Lincoln is also the state capital. 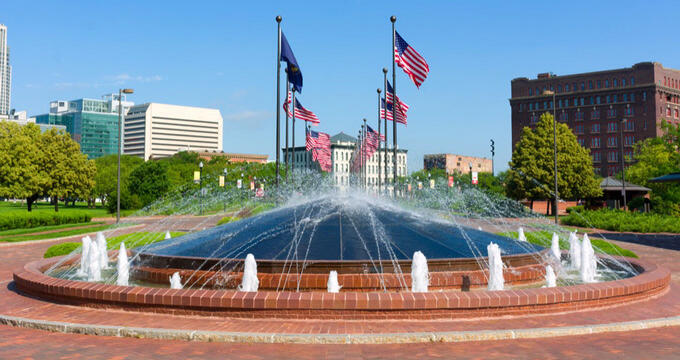 This city was founded back in 1856 and originally known as Lancaster but was renamed Lincoln in honor of Abraham Lincoln when it became the state capital in 1867. A very culturally diverse city, Lincoln has been used as a resettlement site for many refugees from nations like Sudan, Iraq, and Vietnam. Bellevue is the third largest city in the state of Nebraska. This city is located in Sarpy County in the eastern part of the state and is technically a suburb of Omaha, which is the largest city in Nebraska. Bellevue covers an area over 16 square miles in size and is home to an estimated population of 53,000 people. The name of this city means 'beautiful view' in French and the city was founded back in the early 19th century, being incorporated in 1855, which makes it the oldest continuously inhabited town in all of Nebraska. Bellevue was once used as the state's seat of government and the city has seen steady growth in recent years. Grand Island is the fourth biggest city in the state of Nebraska. This city is located in Hall County in the south-central part of the state and is the county seat. Grand Island covers an area of over 29 square miles and is home to over 51,000 people, according to the latest estimates. This city is part of the Grand Island metro area, which encompasses Hall, Merrick, Hamilton, and Howard counties and is home to over 83,000 people. Grand Island has won the All-America City Award on three separate occasions and is regarded as an attractive, safe city and a good place to live in general. Kearney is the fifth biggest city in the state of Nebraska. This city is located in Buffalo County, of which it is the county seat, in the south-central part of the state. Kearney covers an area of around 14 square miles of land and is home to around 33,000 people. This city was originally settled as Dobytown and was constructed two miles away from the present-day site but was later moved due to the development of the Oregon Trail. It was named in honor of a United States Army officer named Stephen Watts Kearny. Kearney is perhaps best-known as the home of the University of Nebraska at Kearney.